I have been wanting a retro bicycle for agesssssssssss but I always like to hold off on big purchases for a while. Lucky I did because on my way to walk the dogs at the waterfront a while ago I spotted a pastel bicycle sitting on a council pick up pile (or junk pile which is what I really call it). 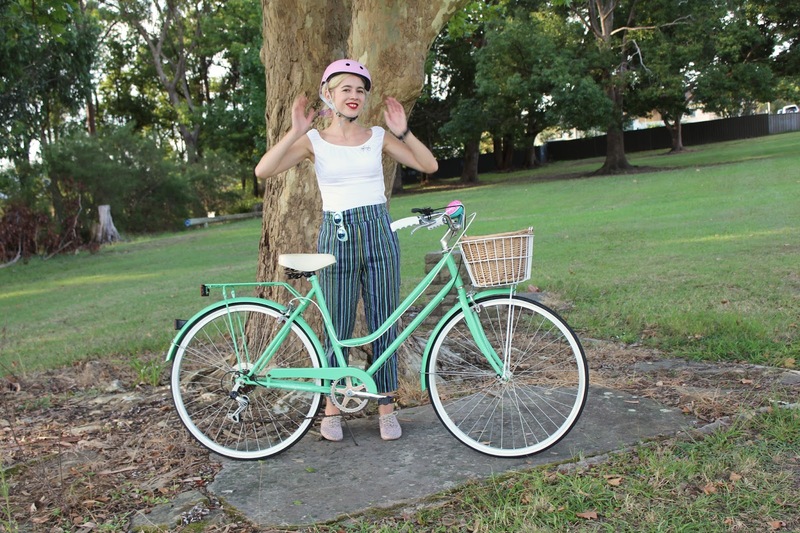 I quickly ran over with Fifi to have a closer look and I could not believe my eyes, it was the exact brand and colour bicycle that I was planning on buying. It needed a bit of maintenance but I am pretty practical and like a bit of a DIY task. 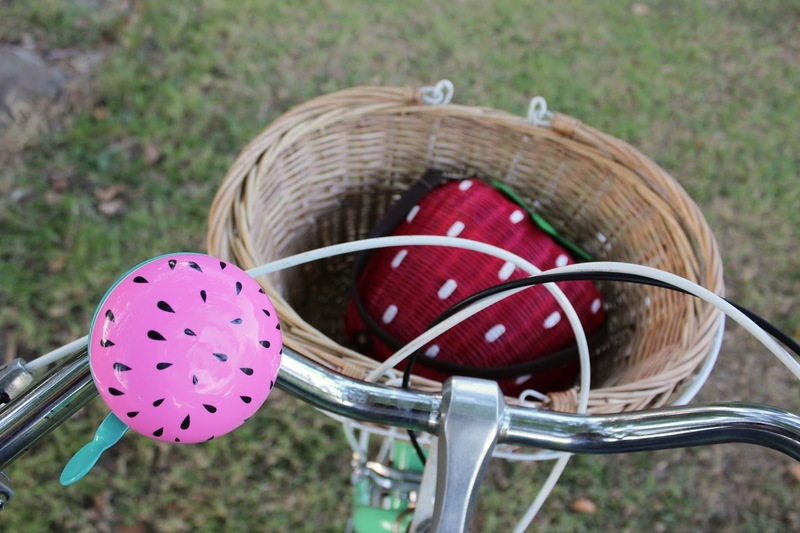 It didn't come with the basket so I ordered one as soon as they were back in stock, the front mud guard was missing so I bought a new one to attach to it, I bought new handle grips and then I found this watermelon bike bell at Kmart! This is a Reid Cycle and they were so helpful when I needed to add extras to my order which weren't on the website and double checked that the mudguard would fit my model. Special thanks to my brother who helped me put the basket on and checked and pumped the tires. The handlebars had quite a lot of rust and after reading a few things on the internet I tried rinsing the rust with soapy water and then I rubbed aluminium foil on the rusty areas, I was amazed at how much better it looked and that it worked. Anyway, I could have just purchased a new bike but I like to fix things up and this was a good opportunity to do just that - I could not leave it to be chucked away and the paint on it is still perfect! 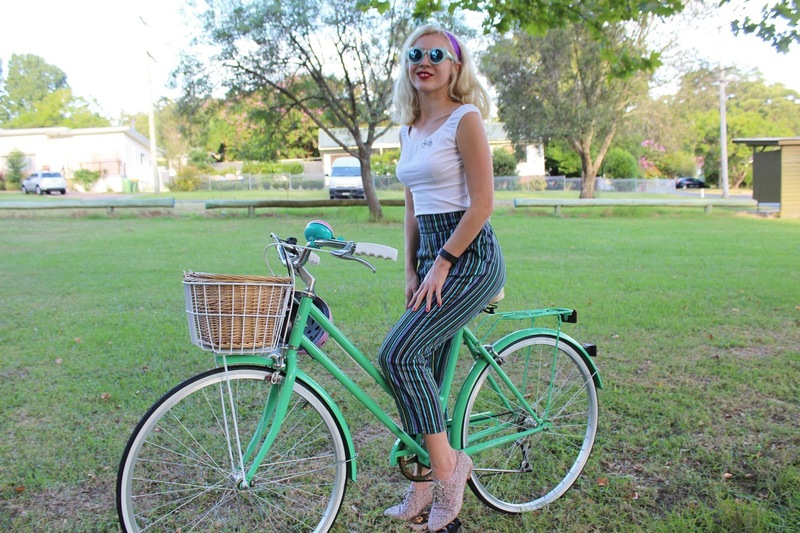 Oh and onto my outfit, I thrifted this top for $2 at a bootsale, I bought the Pinup Girl Clothing pants second hand - they are a size too big but I really wanted the cool cabanana print, I was going to resell them but they have turned out great for bike riding and walking the dogs. 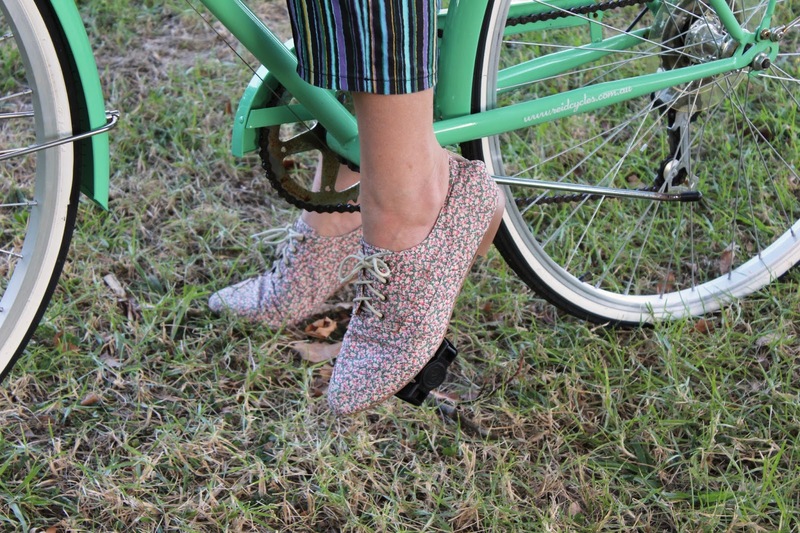 I bought my shoes probably six years ago and recently rediscovered them and of course I had to buy this pink helmet for safe bike riding and it looks cute too. I live in an area with lots of hills so this outfit + the shoes proved to be a great success. Also, I posted a little video of the bicycle in action on Instagram (if you didn't see it). What the heck! How did you get so lucky to find such an amazing bike, It's so pretty! 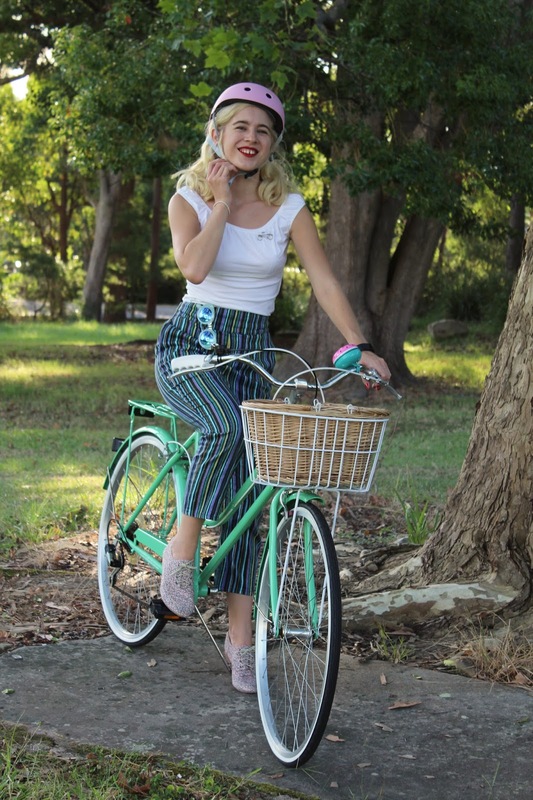 A vintage bicycle is definitely on my list, and if I find an older one that needs maintenance I'll probably go with it since I also love fixing up things too! Loving the outfit too, you look gorgeous as always! Wow, I can't believe you found that bike! It is too cute!! Also I love that vintage brooch! Incredible find!!! 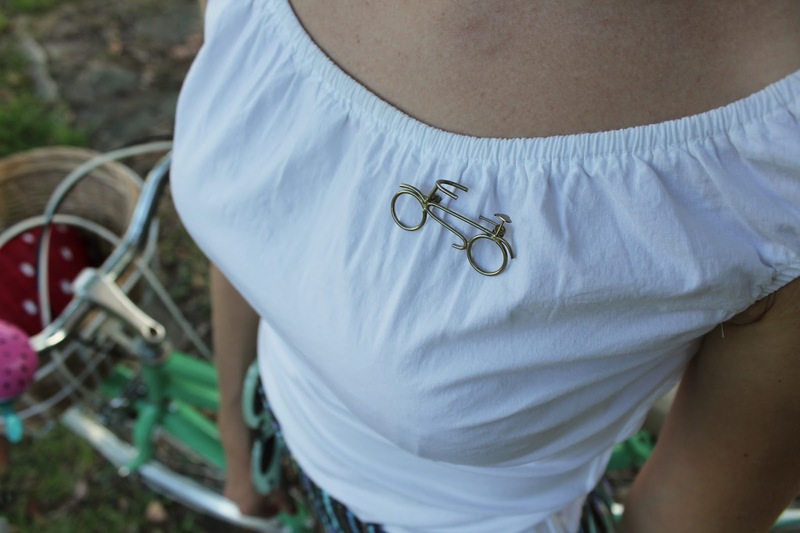 And your outfit matches your bike to perfection! Definitely needed the basket and the bell is just the cutest thing! It is lovely and looks very comfortable, too! Great find with the bike. Superb fix up. 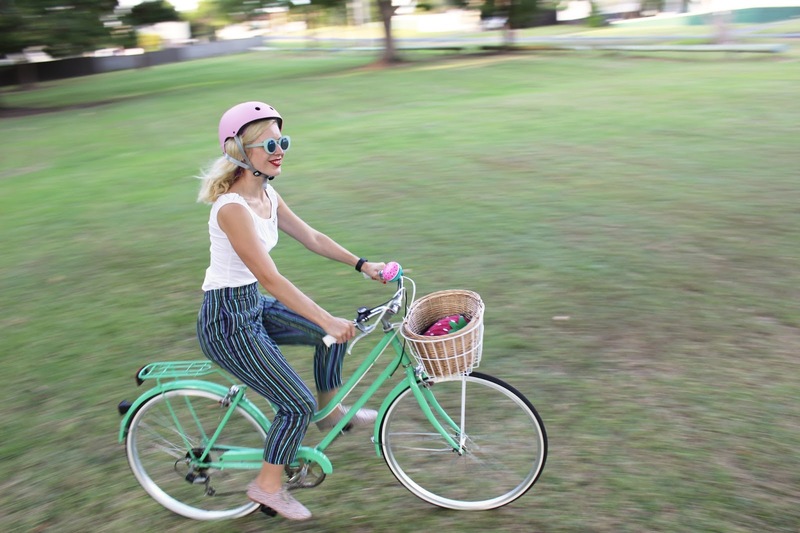 Darling outfit... love how one of the stripes in the pants seems to match paint colour on bike.